Apropos of nothing, dill belongs to the Carrot Family botanically known as Umbelliferae , native to the Mediterranean and used in B.C. 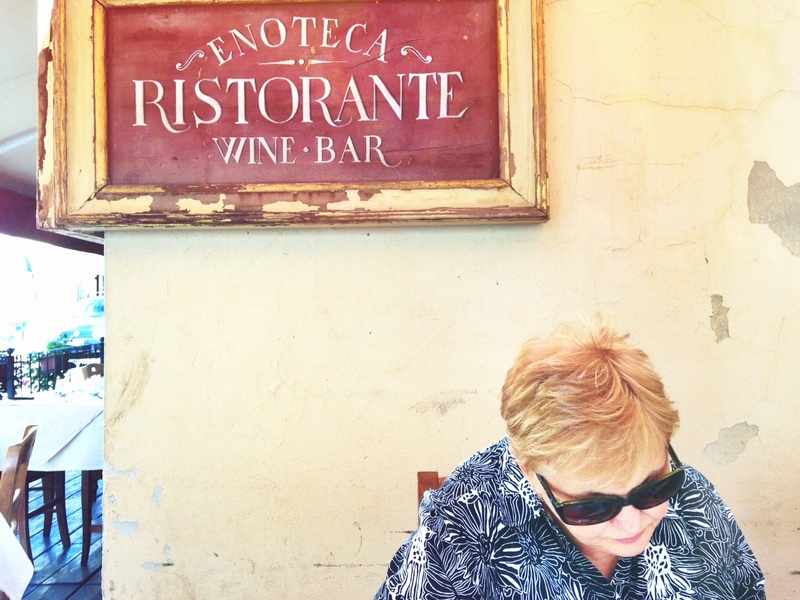 It played a big part in the culinary life of the ancient Greeks. 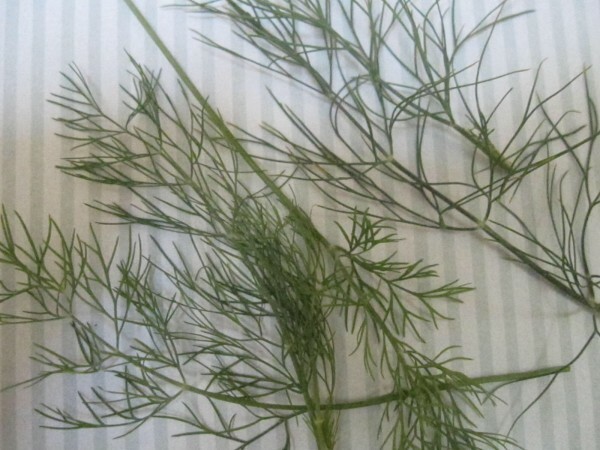 The flavor of dill does not come via its green growth but through its seeds that are rich with essential oils. And these seeds are actually complete fruits, even dry. So that’s our botany lesson for the day. So when my dill takes over my living room, it will be comforting to know it’s just a harmless fruit seeking love. Back to the recipe. There are only 6 basic ingredients in this recipe. So it’s a snap to put together. I use my trusty double-bladed mezzaluna chopper that chops these shallots in no time flat. 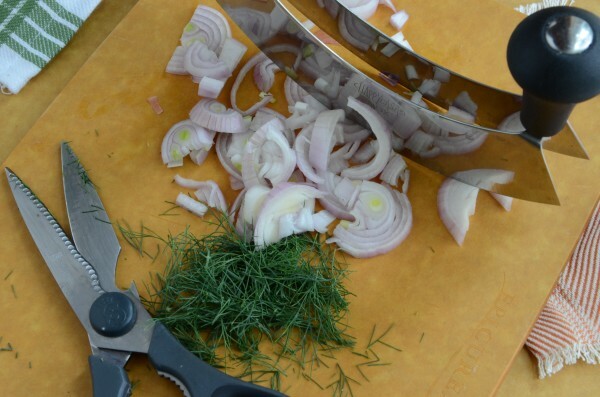 For the dill, some good kitchen scissors will do…then you’re good to go. 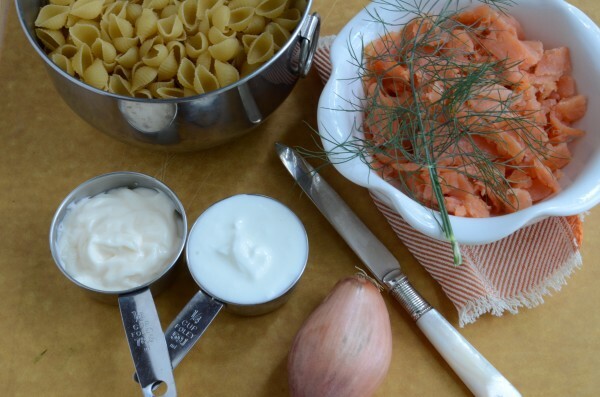 And voila…or as the Italians say, “Ecco!” You have a beautiful pasta with salmon & dill dish. Buon Appetito. Bring 4 quarts of water to a boil. Add one tablespoon of salt and the shells and cook them according to package directions. 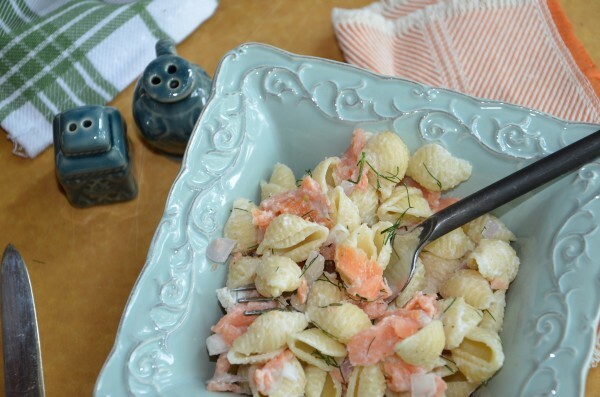 Cut smoked salmon into bite-size pieces and place into a large bowl. Mix the mayo with the yogurt in a small bowl. Chop the shallots and fold them into the mayo mixture. Add this mixture to the salmon. When the pasta is al dente, scoop out about 1/4 cup of pasta water and reserve. Drain pasta well then mix into the salmon-mayo mixture. If the pasta salad is too thick, add a tablespoon or two of pasta water. Fold in the chopped dill. Add pepper to taste. Serve cold or at room temperature. Note: Smoked salmon can be salty so don't salt this dish until you tasted it in its completed form. If you don't care for smoked salmon, you can use grilled fresh salmon or even canned salmon.